I commonly read that sugar in products such as ice cream and cookies is unhealthy, and those with a craving for sweets should redirect their urges to fruits which are healthier and more natural. But why are fruits healthier? A good place to start is this article, where a food scientist/R.D. (registered dietitian) talks about the health advantages of fruit over candy and desserts. I’ll quote a few of the key points here but I recommend you read the entire article for proper context. Let’s look at each of these points in turn with actual fruit and dessert examples. First, no one will deny that fruit has vitamins, antioxidants, water, and a whole bunch of other things we haven’t even identified yet. Since this stuff is natural, it seems logical that much of it is good for the body, and I’m sure there are studies out there that show how certain fruits have various beneficial effects. But stating candy and desserts are “nutritionally void” is an extreme exaggeration that is clearly not true for all products. Sure, many of the popular candy products (think ‘Halloween candy’) and desserts contain a good portion of lab-made chemicals and heavily processed ingredients. But is there any candies or desserts with any nutritional value? Thanks to the health movement which has gained popularly in the last few years, we now see entire grocery stores dedicated to healthy, natural food. In my area there is Whole Foods Market, Mother Earth Natural Foods, and many smaller ones. With this there is are loads of healthier products flooding the markets, those with organic, natural ingredients, and an absence of things like artificial colors and flavors. I would say at least half of the products I’ve reviewed in this blog I would consider healthy, if not more. To give one recent example of a recently reviewed healthy product, take So Delicious’s coconut milk mint chip frozen dessert. It contains several ingredients which are known to have good amounts of minerals and vitamins such as coconut (oil and cream), cocoa, and spearmint. 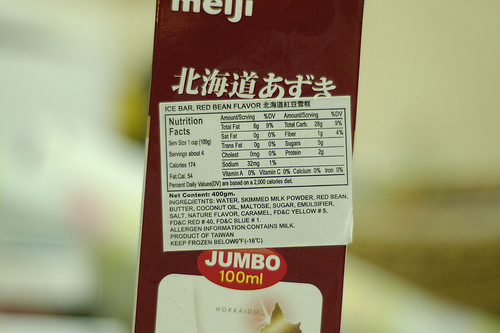 It also contains water, which was another of the items mentioned in the article. This is just one example which clearly has many vitamins and nutrients, and until someone shows me a clinical study comparing specific deserts and fruits showing the actual long-term effects of each, I am not convinced fruits have more vitamins and minerals in all cases. I mentioned one desert product, but there are many like this including those made with cashews, nuts, almonds, soy, rice, and other things thought to be nutritionally rich. The next point is whether fruit has less sugar by volume. I will first list the sugar per weight for a few fruits based on the figures from sugarstacks.com. Next I’ll show the values for a few ice cream/frozen desserts. Overall there is about 70% more sugar in these products, which is consistent with the article’s claim that desserts have more sugar than fruits. Keep in mind, this is just a small sample of frozen desserts, and does not include many other sweet products that have significantly more (or less) sugar levels. Although I only included one product with no sugar added, there are many others of this type, some using sweeteners which may have negative effects on the body (though I would say those are not well known yet). There are even some cases where fruits have more sugar than a frozen dessert, such as grapes (16%) compared to So Delicious’s chocolate frozen dessert (14%). This product utilizes agave as its main sweetener, which some say is healthier than white sugar. There are others which say simply say ‘sugar is sugar’ which would also mean the sugar from fruits and desserts is the same in terms of how the body digests is. I cannot dispute the article’s final point that whole fruit has alot of fiber. However, taking the mint chip frozen dessert I discussed above as an example, it has 6 grams of sugar in 85 grams, which gives around 7% fiber of total weight. Much of this fiber comes from chicory root extract. In this case we can see a dessert has over twice the fiber as several fruits, a few of these were listed as “high fiber fruits”. Just from this quick analysis, it seems obvious to me that fruits do not have an unconditional win in the fight against desserts and candies. By no means am I saying fruits are not worth eating, since studies (plus common sense) say that eating a variety of fruits is best. But if you are careful about which desserts you choose, focusing on those with natural, nutritious ingredients, I think you can still maintain a healthy diet. It make take a little time to get used to these “healthier” desserts after a lifetime of eating the unhealthy, popular ones, but its worth it since then you can eat (nearly) guilt free. My biggest concern about desserts is the high fat and calorie content, though this completely depends on how much you eat. From a weight gaining perspective, its clearly less healthy to eat a gallon of ice cream a day versus a banana. But a quarter-pint (single serving) of most ice creams a day shouldn’t cause significant weight gain. Don’t let an “expert” tell you that you shouldn’t eat desserts. I’m not going to completely stop eating sweets and go all fruit until there is sufficient clinical evidence showing that seemingly healthy products line coconut milk frozen desserts are actually harmful in some way. Do your own research and enjoy the sweetness that desserts bring to your life! I’ll admin I’m pretty new to the world of biscotti. I’ve known about this italian cookie (whose name originated from a Latin word that means “twice cooked/baked”) for many years now, but my first opportunity to try one was when we decided to buy one for our son. That was a different product that was sold in single packages, but since he enjoyed it so much we searched for a healthier product. 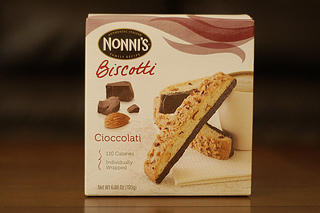 Nonni’s Biscotti Cioccolati is what we ended up discovering. As you likely already guessed, “Cioccolati” means “Chocolate” in Italian. 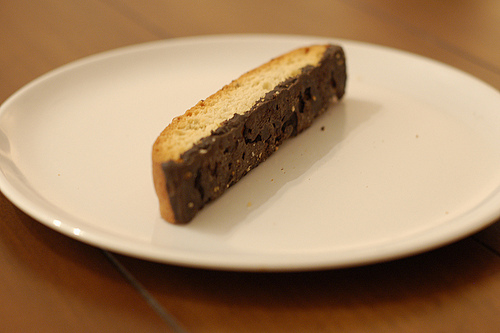 As is typical of biscotti, these are elongated, finger shaped cookies. Nuts adorn one side and a strip of chocolate the other. While both almonds and walnuts are used according to the ingredients list, the nuts were so finely chopped and so sparse that they practically had no effect on the overall texture or taste. This contrasted greatly with the picture on the box (shown above) where the nut size, amount, and placement was much more favorable. I checked the few cookies remaining in the package and some of those looked better than the ones I had eaten, but none looked quite as good as the product photograph. I had two of these cookies before writing this report, and one of them was much crisper and firmer than the other, more what I would expect from a twice-baked product. I’m not sure what happened to the spongy one. Maybe there was a small hole in the packaging which let air in and accelerated staleness. If you are accustomed to super-crispy biscotti, you might be disappointed with this product. The mildly sweet cookie base, whose flavor brings to mind a cake, is balanced by a sweet, thick layer of chocolate. This was the most generous helping of chocolate I’ve experienced on a Biscotti, and as a result I I don’t think I’ll ever to be enjoy other brands with less chocolate the same. There was a minor aftertaste which bothered me, or should I say undertaste since it sort of hid underneath the basic flavors. I don’t think it is inherently bad, but it somehow reminded me of another food product which was unhealthy. I can’t quite put my finger on what it is though. A single cookie has 110 calories and 9 grams of sugar. For a fairly large cookie whose length is about a inch longer than my middle finger, those aren’t bad figures. Most people will tend to nibble a little at a time, so one cookie can go a long way in terms of time and enjoyment. Theres not much to write home about regarding nutrition, with 2 grams of protein, 1 of fiber, and 4% or Iron. Clearly this cookie wasn’t made to replace a meal but nobody’s trying to pretend it does. There are around 20 ingredients which isn’t too bad for this type of product. You can compare to my recent review of Ben & Jerry’s Chocolate Brownie ice cream, which had nearly the same number. There are no artificial flavors, and real vanilla is used instead of the artificial vanillin, which is a nice touch. There is the mysterious “natural flavors” but thats pretty common practice for this type of product. The rest of the ingredients are pretty much standard-fare, with the exception of anise seeds which raised an eyebrow. I’m guessing they use it to improve texture. As a side note, Nonni’s logo contains the phrase “Authentic Italian Family Recipe” and their website claims they have been using the same recipe for almost a century. However I somewhat doubt that chocolate was used back then, at least in such a large proportion. In any case, the cookie base seems like it might very well be authentic, but I’m no biscotti expert. Also its interesting to note that their website claims they are the most popular selling biscotti on the market. Aside from the minor texture inconsistency, I’m not surprised. I got mine at Publix for around $3.00 for a 8-pack. These are also available online at places like Amazon. For less than 50 cents a cookie, they are a great deal! I called my local Whole Foods and they didn’t carry this product, unfortunately. Great tasting biscotti cookie with reasonably natural ingredients and a sweet coating of chocolate. It’s not going to win any awards for nutrition, but its a must-try for fans of biscotti or Italian food.